I really didn't like these muffins at all. Definitely not a repeat. I've been making this banana bread for a long time and it is excellent. It was one of the first whole wheat recipes that worked for me, and is also good with a mix of whole wheat and all purpose flour. The optional dates are a good addition. I usually bake 3 mini loaves instead of one larger one at 350 for 30 minutes. It's adaptable and you can add chocolate chips, nuts, etc as desired. When using oil it's a vegan loaf. I often make this as part of a salad lunch teamed up with lentil and rice salad and some grain salads. Tastes have changed since I first made it and I now cut the sweetness a bit by adding less orange, more lemon, and fewer raisins. Really good. I didn't have cauliflower so added some potatoes. Simple and delicious! Good with Buttercup squash, Pink Lady apple and 1 T dark maple syrup instead of honey. Really like not peeling the squash. I scraped the leftover squash off of the skins and added all the apples and cranberries to the blender and made a great squash puree for the next day. I had been craving cauliflower soup and this fit the bill. Filling and satisfying, the potatoes are a great complement to the cauliflower. I’ve made with either split black gram or garbanzo beans - usually make half the recipe, and I add a bit more water and about a tablespoon of oil to the batter. They can be cooked without fermenting. These are very good dosas and are good with the masala potatoes on the next page. They’re gluten free so a good alternative for those who need to avoid gluten. This soup is really delicious! I used tofu instead of potato to make it a complete meal and I didn't bother to puree it. The only problem with using it for illness is that you might not have the energy to make it yourself if you are really sick. If your head is stuffed up, it is best to eat something with chiles or horseradish. This does not resemble authentic gumbo at all to me, but it tastes great all the same. The batter was so liquid that when scooped onto the griddle it would not hold a round shape. There would be a pile of oats in the middle where I wanted the pancake, and then little rivers of escaped batter coming out the sides; most pancakes turned out looking a bit like a paint splatter. The recipe says to let the oats and milk soak for at least 5 minutes. I probably left them for 10 minutes, and the first few had an unpleasantly raw-oat-y texture, but by the end of the batch they had softened a bit more and were no longer obtrusive. Flavor was alright but not noteworthy. These muffins have a delicate, crumbly texture, and a pleasing, minimally sweet taste. Good with butter and/or jam. This is delicious, everyone seems to like it, and it’s a good way to include lentils in a meal. I always add the optional nuts (I use almonds, cashews, etc), and I also switch the raisins for other dried fruits such as cranberries or dried apricots. This salad is an old friend. Make it at least once a year even though rest of family has no interest! This was fantastic pizza! It was part of a memorable lunch with some other pizzas and salads. This is excellent and very quick and easy if you already have cooked brown rice. Vegetables can easily be varied, for example, red pepper can replace green pepper, etc. The cheese variation is also delicious. The only changes I make are that I add ginger and some chile flakes, I use water chestnuts instead of celery, and almonds or cashews instead of walnuts. The sauce is also good on Asian noodles. 2/2018 I liked this a lot dish years ago but made it again and found it pretty boring. Kids didn’t like it. Other versions with more additions (Madhur Jaffrey’s World Vegetarian for example) might be better. The complete vegetarian cookbook and reference center for the whole-foods kitchen - over a million copies sold! The New Laurel's Kitchen is everything that made the first edition loved and trusted, with hundreds of new recipes and the latest nutritional information. The book contains more than 500 recipes, ideas, menus, and suggestions, each tested and perfected for satisfying, wholesome home cooking. Imaginative recipes use low-cost, easy-to-find foods, with dozens of ways to cut back on fat without losting flavor. There are specific sections on cooking for children, elders, pregnancy, and athletes. 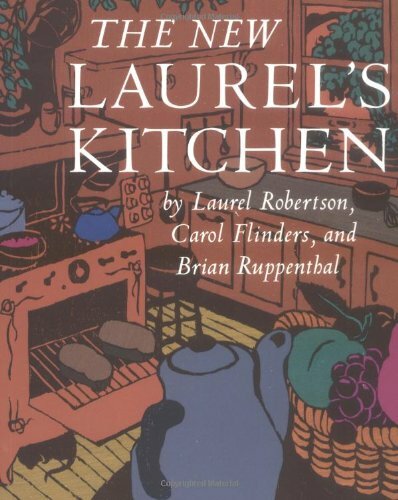 The New Laurel's Kitchen is the revolutionary food guide that makes good nutrition easy, and this classic is still relevant for today's generation of vegetarians and plant-based eaters.